The Winter Solstice, the shortest day of the year and the longest night. Celebrate at our Feast of Odin hosted by the Vikings. Enjoy a full bar featuring Brinkburn St. Brewery exclusive beers and ales as well as sausages and seasonal sharing plates from the Kitchen. 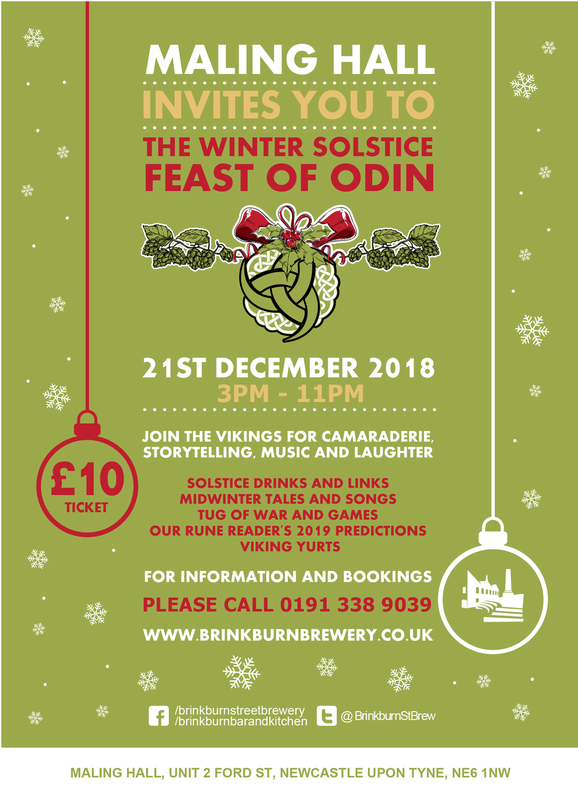 The Vikings will be singing songs and storytelling 6-8pm! Viking games and a tug of war tournament will be part of the festivities too! As well as all this, your £10 includes a free drink, and a gourmet bratwurst in a bun (with sauerkraut slaw, crispy onions & beer-based relishes)! Our doors open at 3 pm and the night ends at 11pm. Tickets cost just £10. Call to book your places on 0191 338 9039. For information about our special offers, new merchandise, gift packs and more, click on the Shop link. For information about events at the Bar & Kitchen, please visit our Facebook page by clicking here.